Ratios and group sizes are regulated by North Dakota state law - North Dakota child care providers must be licensed if they care for 6 or more children including their own. Children receive higher quality care when they are in small groups and adult-to-child ratios meet recommendations or go beyond minimum licensing requirements with the addition of extra care staff. The number of children a provider can care for is determined by their license type, the size of their facility, and the ages of the children. • OR they can care for up to 4 children under the age of 24 months when not caring for additional older children. • Two school-age children can be added to either scenario. Group License Can care for up to 30 children, depending on local ordinance. 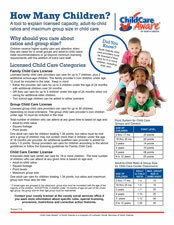 The group child care provider’s own children under age 12 must be included in the total. One adult can care for children totaling 1.34 points, but ratios must be met and a group of children may not contain more than 4 children under the age of 18 months per provider. An additional qualified care provider is added for every 1.0 points. Group providers can care for children according to the above guidelines or follow the licensing guidelines for Family Child Care. One adult can care for children totaling 1.34 points, but ratios and maximum group size must also be met. * If mixed ages are grouped in the classroom, group size must be consistent with the age of the majority of the children. EXCEPTION: If children under 18 months of age are part of the mixed age group, the ratio and group size for their age group must be maintained. Contact your county licenser if you want more information about specific rules, special licensing, provisions, restrictions or corrective action histories.